The flat mini keytons are very light and small handy tools made of aircraft grade titanium. The keytons are 2 1/4'' long and 0.048'' thick, they weight only 0.2 ozs (6 grams). The keytons feature three screwdriver tips, they can be used for screws, small prying, scraping and other jobs where you need a strong and flat tool. Being made of titanium the keytons will never rust and are extremely strong for their size, the anodizing is strong and will not get scratched from contact with keys and other metallic elements. The keytons have a generous lanyard hole that can be used to thread cord, the walls are too big for a splitring so you need to thread cord first if you want to keep it in your keychain. Being as flat as they are the keytons can also be carried inside a wallet, you will never note their existance. 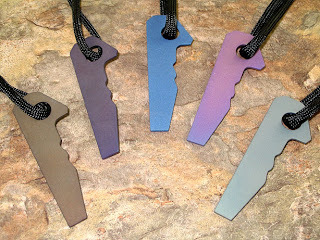 Available in bronze, blue, pink, purple and gray/green. You can order from Peter Atwood's website for $25.